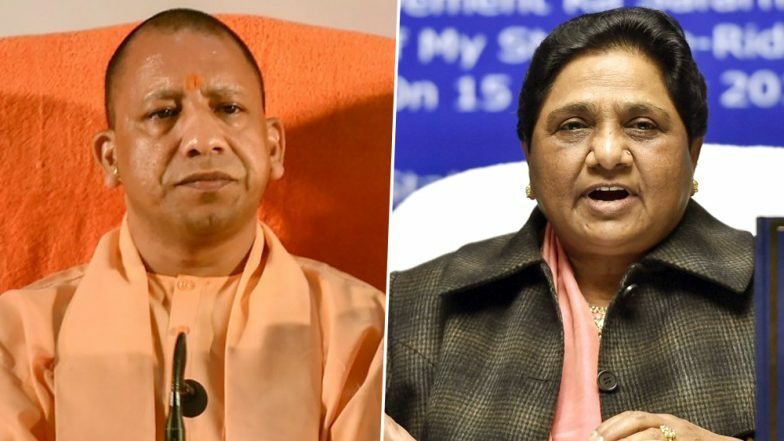 New Delhi, April 15: The Election Commission of India (ECI) on Monday banned Uttar Pradesh Chief Minister and Bharatiya Janata Party (BJP) leader, Yogi Adityanath, and Bahujan Samajwadi Party (BSP) chief Mayawati from election campaigning for violating the model code of conduct. The poll panel barred Yogi Adityanath from campaigning for 72 hours and Mayawati for 48 hours, starting from 6 am tomorrow. The action against Yogi Adityanath was taken for his 'Ali and Bajrangbali' comment, while Mayawati is barred from poll campaigning for seeking Muslim votes. Targetting Mayawati for her recent remarks urging the Muslim community not to split their votes, Adityanath had said: "If the Congress, Samajwadi Party and Bahujan Samaj Party have faith in Ali, we have faith in Hanuman." Congress Complains to EC Against PM's Wardha Speech, Calling It 'Hateful, Divisive'. Mayawati had called upon the Muslim community during the first joint rally of Samajwadi Party, Bahujan Samaj Party and Rashtriya Lok Dal at Deoband that they should not split their votes and vote for the alliance candidates to defeat the BJP. She had also said that Congress is not strong enough for a fight. Both Mayawati and Adityanath were served notices from the ECI. The ECI's action came hours after the Supreme Court pulled up the poll panel for failing to take action against hate speeches by politicians. A bench headed by Chief Justice of India (CJI) Ranjan Gogoi said the ECI is duty-bound to take action against those who make hateful remarks and violate the model code of conduct. Earlier today, the ECI admitted it was "toothless" and "powerless" vis-a-vis hate speeches made during the election campaign. The Election Commission told the court that it can merely issue notice, then an advisory and lodge a criminal complaint in the case of repeated violations. The counsel for the poll body said it was "toothless" and "powerless" against hate and religious speeches made during the election campaign.